with the eigenvector . Because the wavevector now points in the -direction, this is clearly a transverse wave polarized with its electric field parallel to the equilibrium magnetic field. Particle motions are along the magnetic field, so the mode dynamics are completely unaffected by this field. Thus, the wave is identical to the electromagnetic plasma wave found previously in an unmagnetized plasma. This wave is known as the ordinary, or -, mode. Figure 5.2: Schematic diagram showing the dispersion relation for a left-handed wave propagating parallel to the magnetic field in a magnetized plasma. with the associated eigenvector . Let us, first of all, search for the cutoff frequencies, at which goes to zero. According to Equation (5.99), these frequencies are the roots of and . In fact, we have already solved these equations (recall that cutoff frequencies do not depend on ). There are two cutoff frequencies, and , which are specified by Equations (5.93) and (5.96), respectively. The first resonant frequency, , is greater than the electron cyclotron or plasma frequencies, and is called the upper hybrid frequency. The second resonant frequency, , lies between the electron and ion cyclotron frequencies, and is called the lower hybrid frequency. Unfortunately, there is no simple explanation of the origins of the two hybrid resonances in terms of the motions of individual particles. 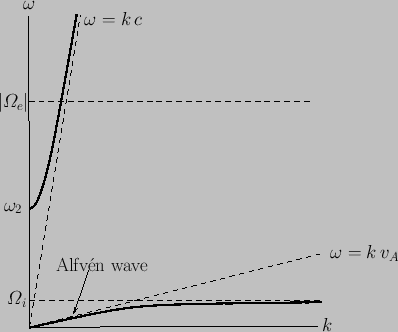 At low frequencies, the mode in question reverts to the compressional-Alfvén wave discussed previously. Note that the shear-Alfvén wave does not propagate perpendicular to the magnetic field. Figure 5.3: Schematic diagram showing the dispersion relation for a wave propagating perpendicular to the magnetic field in a magnetized plasma. we deduce that the dispersion curve for the mode in question takes the form sketched in Figure 5.3. 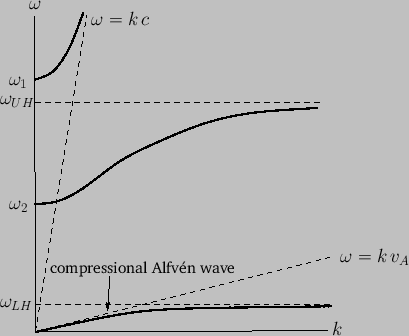 The lowest frequency branch corresponds to the compressional-Alfvén wave. The other two branches constitute the extraordinary, or -, mode. The upper branch is basically a linearly polarized (in the -direction) electromagnetic wave, somewhat modified by the presence of the plasma. This branch corresponds to a wave that propagates in the absence of an equilibrium magnetic field. The lowest branch corresponds to a wave that does not propagate in the absence of an equilibrium field. Finally, the middle branch corresponds to a wave that converts into an electrostatic plasma wave in the absence of an equilibrium magnetic field. Wave propagation at oblique angles is generally more complicated than propagation parallel or perpendicular to the equilibrium magnetic field, but does not involve any new physical effects (Stix 1992; Swanson 2003).